Revolve Productions. 1985. Director: Derek Strahan. 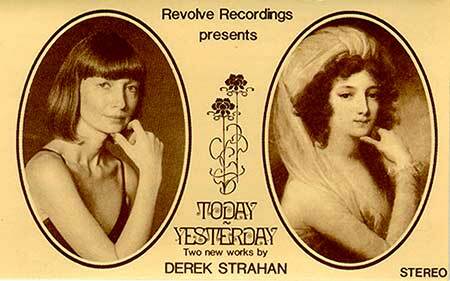 Music: Derek Strahan. Not released theatrically, although it was screened on the Nine Network January 05 1997. CA(t)	(OP)	Revolve. RDS002C. 1981. “TODAY/YESTERDAY”. (Music is strongly featured on the film soundtrack). The John Gould Quartet with Alan Vivian, Clarinet. Quartet: John Gould - Leader, First Violin. Irene Donohue - 2nd Violin. Jane Hazelwood - Viola. David Pereira - ‘Cello. Recorded at Studio C, 2MBS-FM. Recording Engineer: Ian Bull. Editing: Sheard & Co. Post Production: Studio 301. Mastered & Manufactured by: Idris Pty. Ltd. Produced by: Derek Strahan. String Quartet No.1 (“The Key”). Clarinet Quintet No.1 In D Major (“The Princess”).